Presumably, the German footballers passed the World Cup trophy around at a good tempo with no unnecessary showboating or fumbles. The 2014 World Cup belonged to the efficient, unrelenting Germans in the end. And the baby-faced assassin Mario Götze, who drew ire last year for ditching boyhood club, Borussia Dortmund, for fierce rival Bayern Munich, is now his nation’s poster boy after steering home the only goal in the 113th minute of an enthralling final. 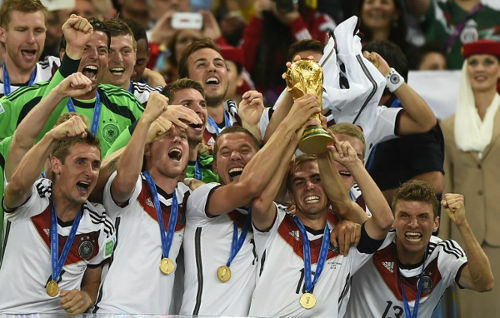 Photo: Germany defender and captain Philipp Lahm (second from right) lifts the World Cup trophy with his teammates. And Lionel Messi, the really talented Argentina footballer who could not walk on water, had to settle for a runner-up medal. Was Argentina punished for not having a proper team but just one really good player? Götze’s goal was the first that Argentina conceded in 443 minutes; so unless Messi played in central defence or goal, I suspect there were quite a few players responsible for Argentina’s relative success. How come Germany only scored once? Because David Luiz does not have an Argentine passport. Does this prove that Lionel Messi is overrated and flopped again? Messi is only the player to win the FIFA Player of the Year crown four times and he was named the World Cup’s best player, which is an accolade previously held by the likes of Diego Maradona (Argentina), Ronaldo (Brazil), Romario (Brazil) and Zinedine Zidan (France). He got on the MVP shortlist after being elected by a technical committee that includes former greats like Michel Platini (France), George Weah (Liberia) and Karl Heinz-Rumminegge (Germany). Chances are they know a bit more about football than the guy with Kermit the Frog as his profile picture. No question. I just want to say: Eat sauerkraut, Mr Live Wire! You are crap just like your beloved Argentina! Hold on; let me get my fly swatter. Photo: How many teams did you back in this World Cup exactly?! In some ways, Argentina was the surprise package of the World Cup. La Albiceleste was among the pre-tournament favourites; thanks to the offensive talents of not only Lionel Messi but Sergio Agüero, Gonzalo Higuain and Angel Di Maria. But it was Argentina’s supposedly creaky defence that exceeded expectations as Higuain and Di Maria—the latter was injured in the quarterfinal—scored just once each while Agüero finished the tournament with less goals than Brazil’s centre-forward impersonator, Fred, who also got one. And, although analyst and ex-Trinidad and Tobago national youth team coach Keith Look Loy might disagree about Argentina’s attacking endeavour, coach Alejandro Sabella played five different strikers over the course of 122 minutes today. 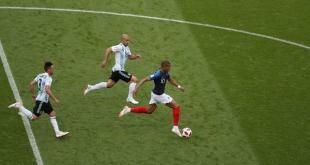 And, far from a defensive manouevre, Sabella threw on a potent weapon when he introduced the slick-passing Fernando Gago in the 86th minute while Götze, who came on three minutes later for Miroslav Klose, was actually asked to throw an eye on him. It was Germany who made the defensive change and not Argentina. But history would not remember it that way, particular after the 22-year-old Götze’s superb winner. Earlier, Higuain scoffed the best chance of the match in the 20th minute and ended up with the foolish look of a guy who suddenly forgot his girlfriend’s name while trying to introduce her to an ex. And Palacio’s scooped miss in extra time was even worse. Both teams ended with 10 attempts on goal but, shockingly, Argentina did not force a single save from Germany goalkeeper Manuel Neuer—although Neuer did leave his mark by blasting Higuain into next week as they challenged a loose ball. 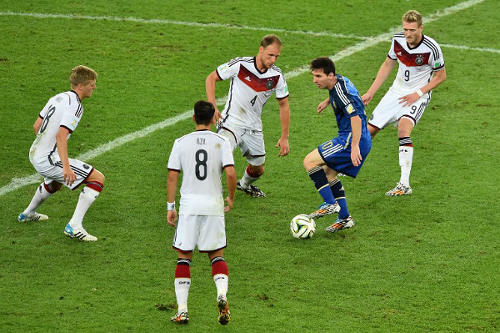 Photo: Argentina captain Lionel Messi (second from right) looks for a way past Germany players Andre Schuerrle (far right). Benedikt Hoewedes (centre), Mesut Özil (second from left) and Toni Kroos. He couldn’t beat four Germans?! Clearly, the boy is overrated! Germany, unsurprisingly, was not as wasteful; and that was the difference between dancing along to “Happy” after the final whistle or praying for the Maracanã Stadium to swallow you up. German midfielder Bastian Schweinsteiger, who ended the match with stitches under his right eye, was a colossus while Jerome Boateng and captain Philippe Lahm were brilliant too as the attack-minded Europeans kept pawing away at their South American opponent. 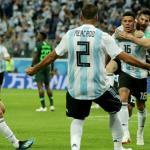 Javier Mascherano and Marcos Rojo at the other end were defiance personified as they kept the Germans at bay while instigating potentially decisive Argentine counterattacks. But Argentina’s millionaire attackers, all playing for high profile clubs at the best leagues in the world, could not deliver when it mattered. Die Mannschaft could and did. And, at the final whistle, tiki-kaiser replaced tiki-taka. Photo: German midfield ace Bastian Schweinsteiger. Midfielder Bastian Schweinsteiger wrote his name in German folklore today alongside the likes of Lothar Matthäus and Franz Beckenbauer. Argentina striker Rodrigo Palacio’s only goal this year came in a friendly against Trinidad and Tobago. And, with all due respect to “Soca Warriors” custodian Jan-Michael Williams, Germany goalkeeper Manuel Neuer is a bit better. So, the result of Palacio’s improvised scooped finish in extra time today was depressingly expected. 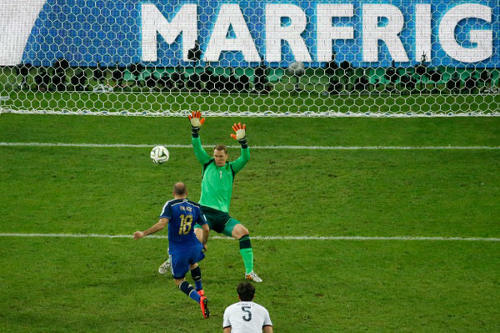 Photo: Argentina’s rat-tailed forward Rodrigo Palacio (centre) shoots past Germany goalkeeper Manuel Neuer but wide of the goal in the 2014 World Cup final. Let us just say that the Inter Milan striker’s rat-tail hairstyle was not his worse decision this tournament. And that haircut would take some beating. Previous 2014 World Cup: The stars, wanna-bes and flops! Lasana Liburd you are totally correct the people don’t understant the football as well as they think !!!!!!!! Dear LL, I empathise and I sympathize. From the get go I said that I was an avid supporter of Argentine football. I also made the point that Messi is underutilised by playing in that position. Messi has strengths which are borne out of tiki taka. 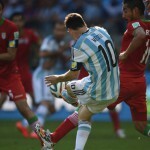 Messi also has weaknesses whereby he does not run. Adrea Pirlo ran 11.58 km in the game vs England and completed 131 passes which is more than the 4 English midfielders combined. Pirlo is 35 years old! Messi is 27 years old and averages 8 to9 km per game. To be great one has to overcome his or her own deficiencies. I repeatedly said that Gago should have been up front playing like a Martin Palermo to trigger the tiki taka Messi thrives on. Maybe Tevez was a good choice as a hold up man who actually gets back on defence regardless of his temperament, he brings impetus. I can go as far to say that Messi maybe has to go on loan to Boca or Estudiantes for a month before he can really perform in the Argie essence for his country. But is it fair to have team mates covering distances and not holding back in tackles to help the team and one man refuses to even go out of his comfort zone? And he doesn’t even take a yellow card for the team? Rojo should be mentioned as one of the better Argentine players in the World Cup. Demichelis’ performance was a surprise. The other guys stepped up and accepted responsibility. The team was just firing on one cylinder less against quality opposition. When we reflect, referee decisions in the group stages for ‘favourite’ teams were the black magic of the tournament. California Chrome did not win the Triple Crown because he was not prepared or ridden on his strengths to do so. This does not automatically mean Chrome is a bad horse when he lost. Funny that everyone say Argentina was one player not a team. And when Argentina goes all the way to the final and holds Germany scoreless for 113 minutes, they say the player not good either. So Argentina supposedly had a poor team and an underperforming player. That means either Argentina got to extra time of the World Cup final by black magic or people don’t understand football as well as they think. Well said!!!! I think it’s the latter btw. It is a column not a sport news article Kendall. I was always very open about who I supported from the first piece even before the World Cup started. Declaring my allegiance was part of the fun. And I poked fun at myself for it at times. Wait we basing this on responsibility, then out Neymar in their because partner he had responsibility. Brazil relied on that guy for everything. Neymar don’t deserve it. I would give it Muller. How about Lahm. For me his leadership and his influence and responsibility to the team. Someone from the winning team should be MVP. This post is in relation to Sello on the other thread and other posts on this one with regard to a number of points. How come other European teams rose to the occasion with the help of various individual talent? Did talents like Shaqiri and Schurrle just appear out of thin air? What is the Ballon D’or really? Why is it given to players who do their jobs- attack and score and not so much so to defenders, defensive midfielders, goalkeepers who also do their jobs? Can’t there ever be another Cannavaro, Buffon to win it again? We don’t know. Is it only so for jersey sales? Is it a popularity contest? Is the false 9 the fashionable choice these days? Why are systems built around a false 9? Why has Germany won without their no.10? Is the winner of Ballon D’or in Europe automatically the best in the World? 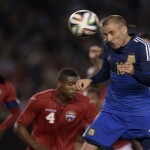 Then why did Concacaf nations and players reach so far and provided some of the better quality games in the tournament? Ask yourselves why certain teams opted for 2-6-2 and 4-6-0 systems which were loaded with midfielders who are capable with pretty attacking play. Winning smaller tournaments with these systems will obviously be studied by good managers and not respected by ‘smaller’ hungry teams. Mascherano, Zabaleta, Lahm, Shweinstieger, Mendel, James Rodriguez, Kuyt maybe even Pogba. I am curious to know of the blog moderators and fellow bloggers on their opinions, thoughts on the award of the Golden Ball. Rodriguez did not have Messi’s responsibility. He played pretty football with a pretty football team that couldn’t cope when they had to slum for a victory against tougher opposition. Mascherano was immense in his last two games. But without Messi they would not have gotten that far. Muller, Rodriguez and mascherano have never felt the responsibility Messi does. For me, he deserves it. What Rodriguez did, playing some nice football and leaving in the quarters, doesn’t come close. Prince it wud nice but u see this part ……….let their be promotion and relegation it won’t work Lol. Personally I’d have given both awards to James Rodriguez, if my views were important ha. The issue with Messi was him not scoring in the knockout rounds, he didn’t exactly take them 2 the final with individual brilliance. That credit would go to ARG defence who many people included Sabella who is famously quoted saying “I cover my face when ARG defend” ha, stepped up in a big way. Mascherano was prob ARG best player, now that I think about it. Name the player who was better than Messi in this World Cup and then say when he provided evidence of that. We never truly saw the scary attacking Argentina from the world cup qualifiers. The lack of form & injury to Aguero/Higuain/Palacio didn’t help Argentina throughout this world cup. Their form was key to getting best out of Messi & essentially they became too reliant on Messi magic to win. This is where leaving out Tevez, slightly came to haunt Argentina – he was the in form ARG striker in club season just concluded – although I accept potential problems he could have brought. That may be so but I think the bias is a little to evident for a sports article. After all, Germany also had several chances to score as well including hitting the bar. It was a tight game but I don’t believe that Argentina was the better side on the day. And I am not just saying that because I didn’t want Argentina to win. The loss of Di Maria made it very difficult for Argentina to win that cup. I would also question the repeated slight of Maxi by Coach Sabella…I think hd did pretty well whenever he did get on thd field. In the words of the great philosopher, Popeye: I am what I am. You certainly wore your heart on your sleeve in this article. Argentina Strikers only scored once for the competition… There wasnt an opportunity for the bounce pass to open space for MEssi! Sabella went on the attack that was great! Was LAvezzi injured? The Best Team of The World Cup won!! But the better team in the finals lost!! Lol. Reminds of when Mourinho told Frank Lampard he was the best in the world at a time when Ronaldinho was unstoppable for Barca. Yes folks, the Lahm and a Goet(ze) shepherded the Germans up the pavilion steps to collect the World Cup. It was revealed right here on 868 what would happen to Argentina if Sabella continued to use Messi up front and he could go back to coaching Gentle Ben instead if he ignored our posts. The prediction on 868 was that Sami Khedira would determine the outcome of this game. And what about his late withdrawal before the start? Kramer was his replacement, then Shurrle who provided the cross for Dennis Bergkamp to chest then sink the Argentines! Sorry wrong World Cup, it was Goetze. He was the most sensible player who apparently reviewed tapes. It was also made public right here how lazy Messi is. Bradly of the USA ran a whopping 15km in extra time and Messi averages 10km in extra time. Mascherano completes the most passes with about 400 or more by now and runs about 11 to 13km to Messi’s 8km in normal time. And the Golden ball goes to… the player who can perform best and score against lower ranked teams in the world with suspect defences! What a disgrace! Anyone who is spoon fed passes over a career to his feet and does not work to win back possession for other team mates has to be “really goods yes” according to Earl Mango Pierre. Argentina could not help themselves to the déjà vu of receiving another PICKER from Germany a generation later. 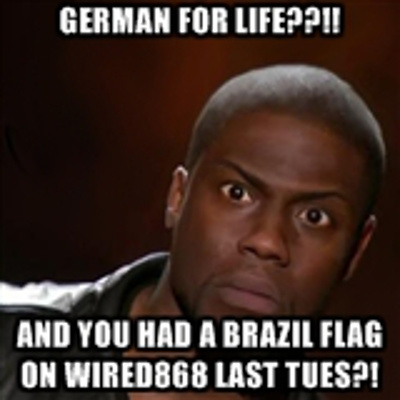 Was this worse than the just for so seven goals Brazil got in their German encounter? I would think so. The world was hoping for the ‘maestro’ to work some magic and pull a rabbit out of a hat but all he could do is pull a crappaud out of his back pocket instead. Man why can’t the World Cup be every 3 years. Or have an international league instead of Friendlies. And let their be promotion and relegation. International football does so much for the world when it’s competitive. Prince Borde, Messi has not scored since Aguero’s injury. When he has two strikers ahead, it brings the best from him. And Argentina started the second half really well. The problem is Aguero never hit form and he disappointed again. And then Neuer blasted Higuain out of the sky and that was it for him too. I thought it was a reasonable change from Sabella although it didn’t work. But that was a gem of a cross from Schuller. Gotze finish was world class that ball was amazing. He was man of the match for me. He was always probing. And Ozil showed up today. Lasana Liburd do you think it hurt them that they went to a 4-3-3? Chances started opening up for Germany. I knew it as a matter of time before Germany unlocked that team. Also we must remember that Argentina only allowed 4 goals all tournament. That’s great stuff. I promise you Brazil would do anything to play over their semifinals and put more players behind the ball like Argentina did. I also thought Zabaletta did well today. They didn’t really attack down his side. They did score down his side no? And how may last minute tackles did Boatang had on Messi. I also think Gago did well. The sad thing is Argentina played Germany on an off day for them. Or did Argentina force them into a bad day. This is a WC final, the highest echelon in world football. For Higuain to miss that gift was unforgivable, especially given that Argentina eventually lost the game. I thought Higuian was great, Di Maria as well, but Messi and CR7 can have a few beers over the experience of being a ballon d’or winner willing and able to carry your national team and they just can’t seem to keep up or the team chemistry falls short. That’s right Kern A. Spencer. And I won’t second guess the coach. He was excellent. I was disappointed in Look Loy’s statement that Argentina brought on a defender to hold on. Argentina went from 4-4-2 to 4-3-3 in second half and then brought Gago on to playmake like Pirlo. Passes were zipping around in midfield and Low responded quickly by taking off a striker and asking Gotze to drop in midfield and help get Gago in check. And Gotze did an excellent job. The TV6 panel totally missed the significance of those changes. Gago was used as a defender in previous games. 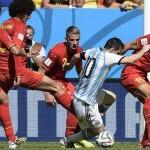 Argentina sat back on their diamond for most of the game so it appeared that he went on as a defensive tactic. It was useless as he should have been played up front to hold up the ball for Messi. Messi should have gone wide right to negate Shurrle from making those runs, cuz Shurrle would have had to cover. Mascherano then would have become more industrious with forward play and that crappy display of football would not have occurred. I could be wrong but I feel the coach left out Tevez for the same reason Deschamps left out Nasri . They are disruptive elements in the dressing rooms , when things are good , no probs, but when things are sticky, they can disrupt the entire team. Germany held its nerve and applied the finish. That is what champions do. I have no problem crediting them for that. Argentina has been missing chances and been on a goal drought all tournament. After that Belgium game I knew they weren’t gonna go far. Germany deserves this win. I can’t say that about quite a number of past winners especially the Cannavaro-led Italy. Argentina had good chances, and the front line just lacked that finishing touch. If Higuain scored that gift early in the game, who knows how the game may have evolved. But…….what is done is done . Goals win matches not reputations.